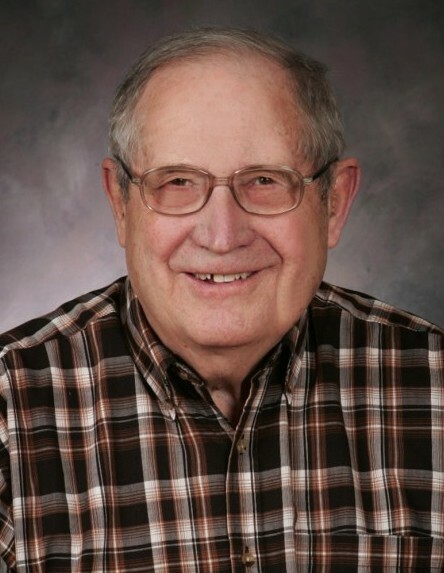 Michael Henry Froelich (Mike), age 92, of Albany, died peacefully on Monday, April 15, 2019 in Sauk Centre, Minnesota. Mass of Christian Burial will be held at 11 a.m. Tuesday, April 23 at Seven Dolors Catholic Church in Albany with Rev. Edward Vebelun, O.S.B. officiating and Rev. Julius Beckermann, O.S.B. concelebrating. Entombment will be at the parish cemetery. Friends may call from 4 to 8 p.m. Monday and from 10 to 11 a.m. Tuesday at the Seven Dolors Gathering Area in Albany. Parish prayers will be at 4 p.m. and a rosary at 6 p.m. Monday evening. Michael Froelich was born December 23, 1926 on a rural farm northeast of Albany, Minnesota to John and Anna (Novak) Froelich. On September 19, 1950, he married Eleanor Brake in Ward Springs. The couple lived in Albany all their married lives. Mike worked at Kraft maintaining the machines and equipment. He was mechanically inclined and liked to invent, design, fix, tinker, weld and work on projects. He worked on projects until he was satisfied with the results, and was always willing to share with others what he learned along the way. He was a loving and devoted husband, father and grandfather. He enjoyed spending time with his children and grandchildren. After his wife passed in January 2018, his last year of life was enjoyed living in Melrose with his grandchildren/great grandchildren. Survivors include two daughters, Mary (Mark) Monroe of Melrose and Donna Blaha of Waite Park; grandchildren, Greg (Michelle) Monroe, Lisa (Christopher) Atkinson, Amanda (Amanda) Kaiser-Lee, Anthony Kaiser, and Melissa (Matthew) Crea; seven great-grandchildren with one due in July; brother, John Froelich of Hawick; sisters, Jenny Dumont of Freeport, Josephine Sadlowsky of Avon, and Margaret (Mickey) Altman of Waite Park; and many nieces and nephews. Mike was preceded in death by his parents, John and Anna (Novak) Froelich; wife, Eleanor (Brake) Froelich; sisters, Ann Dumont, Rita Willenbring, and Alma Altman; and brothers, Louis, Melvin, Andrew, and Frank Froelich.